Changing Seasons…Homecoming, Fall Harvest, Family Gatherings and Fire Prevention Month…What does this mean for the Architect and Interior Designer in me and to you the Home Owner. The kids are back to school, the air has a bit of chill in the morning and I am starting to see some color on the leaves. So it is only right that I should see the overflow of magazines in the mail all with beautiful warm settings for welcoming friends and family to gather around and take part in the Harvest Bounty. There are candle lit tables, jack-o-lanterns and lots and lots of cooking being discussed in these product magazines and on line. It is no accident that this is the retail season for Tables and Table Settings when it comes what is on the shelves in the stores right now. 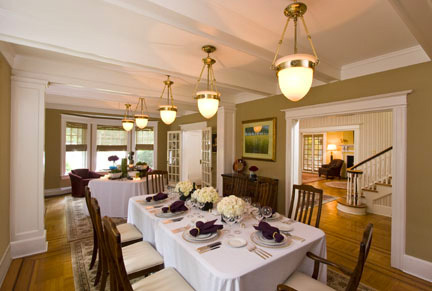 Fall is Celebrating the Harvest with Cooking, Dining Room Sets and Table Settings. From the dishes to dining room tables the stores are trying to sell a gracious lifestyle. They offer new ideas along side their products on how to add a little something extra to your apple pie with this pretty new pie pan or a Roasting Pan with “how to Turkey 101”. You are reassured that if you just buy their table and wares you will become the best entertainer that ever was. Your family members will gather with smiles bringing you the most thoughtful hostess gifts (also available in their stores) beautifully dressed and very good looking too. However, very few articles ever address the challenges of the season like enough room at that table, or how many people can actually gather to eat at that table. So some tips for the Season and what will fit…. The Chair backs are high and the ceiling is low in the tradition of Frank Lloyd Wright centering the attention in on the Table and the conversations. The smallest dining room size of any use is 12 feet by 12 feet and will accommodate six nicely and eight if your friends and the table expand. To insure good conversation and easy passing, tables that are rectangular in shape and about 36” wide work the best. Round tables are great especially if you are into being equal as there is no “Head” of the table. A 48 inch round table seats six. A 60 inch round table seats eight to ten depending on the style of the chairs used. The bigger the round table and depending on how that table expands, the more you may want to consider a “lazy susan” for the center of the table or setting a buffet. If the table becomes an oblong shape you can typically squeeze folks a little closer around the end as the “head” of the table is not as predominate. When looking at tables that extend, take the time to analyze weather or not you really get more seating. In some cases, the legs from the table interfere with the seating and additional settings are not actually gained. Consider a Pedestal base to avoid this. Often the table is featured in the store and catalogs with chairs on the end when if fact there is no over hang or the table is too narrow to have guests on both sides and someone sitting on each end. For a table to have a seat at the ends it often must be wider than the 36 “ as the depth of the table will take up the place settings on both sides. Don’t be afraid to try things out. Get some blue painter's tape and mark out the table on your floor. Take place mats to the store with you or grab some of theirs and put them around on your prospective table. Keep in mind that to be able to walk around someone that is seated at the table you will need 42” clear from the edge of the table to the wall, 48” is more gracious and means no one has to turn sideways or scoot in. Do you ever entertain and move the dining room table to the side? If so, you may want to make sure that the fixture is retractable or hung high enough that your taller guests don’t hit their head on it. If you never plan to move the table or have a standing cocktail style party, it should be installed so that the bottom is 36” off the table surface. 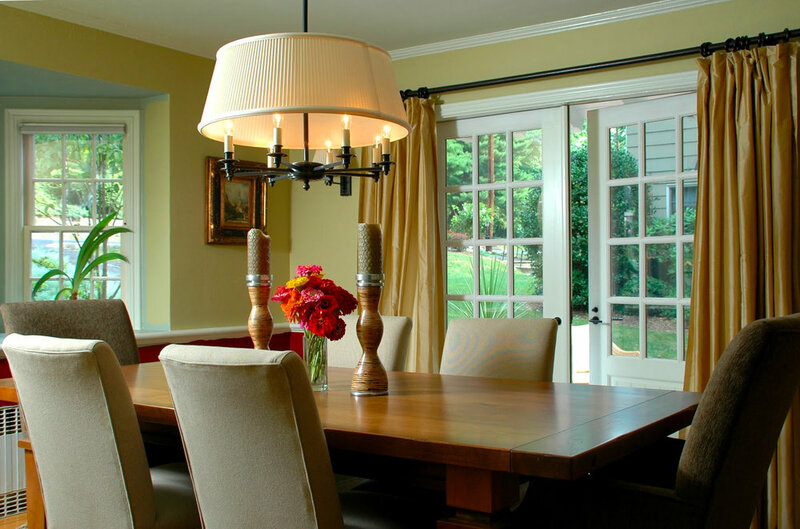 Wondering how big the fixture should be, add the length and width of the room together and then exchange the word feet with inches and the diameter of the fixture should be in inches. (i.e. 14 feet + 18 feet = 32 feet so your fixture should be 32inches in diameter. And always choose to have the fixtures on a dimmer switch. Candles are a great way to set light, decorate and add glamour to any event. Using glass chimneys to them will keep them a little safer …just keep in mind that with all the cooking, entertaining with candles and a fires in the fireplace it is no accident that the National Fire Protection Association has made the Fall "Fire Prevention Awareness Season"….humm. Enjoy the season and the feasts and channel your best Martha whether you are the host or the guest. For more guidelines and considerations about buying wood dining room tables check out the Amish Direct Furniture web site. They offer diagrams and information about the construction of quality furniture and even more things to consider. Now I need to get back to work helping clients with those final details on their newly designed Clawson Kitchen as they have all graciously offered to host their Family's Holidays. oh wait...and have your chimney cleaned so you are ready for the cold.